The Pink Eye is an articulated M12 Eye Nut with a SWL of 1653 lbs. It is manufactured from high tensile forged materials and annealed. Unlike standard Eye Nuts the Pink Eye can be used in unfavourable load directions (not permissible for DIN 580). In accordance with EN 1677-1, the Pink Eye is 100% electromagnetic crack detected and can be used with any clamp from the Doughty® range which accepts M12 fixings. 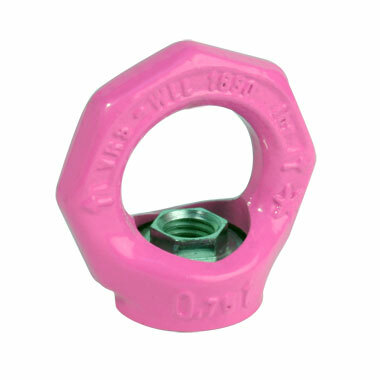 The Pink Eye Nut should be mounted with a 10.9 graded bolt.